Q: Will I ever figure out how to actually do things instead of thinking about doing things? It reminds me a little of Mary Poppins. You know the scene where she makes a game out of cleaning the nursery? It might not be all fun and games on the way to the ultimate goal, some adultung wel be required, but fun, love, celebration, passion can be a potent igniter, like the blob of stuff at the end of the matchstick. Of all of your ideas, what is the one that most “lights your fire” right now (Wands->fire as you know). Of all the stuff that has to happen to make that idea real, which step are most ‘hot’ to do? It might not be something you can do now, but it might be the carrot on a stick you need to help move from planning (a very good thing that should happen) into starting & doing. Ellen Dugan describes the Ace of Pentacles as magick manifested in the real world. 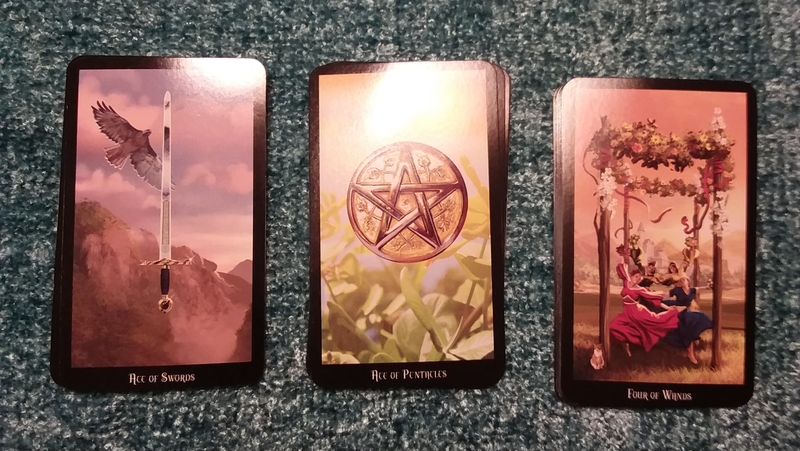 Since you know Tarot, consider the fine points of difference between dose deal actual manifested stuff with this card … It feels more practical elbow-grease level than the esoteric process of manifestation that you might get with the Magician. “Pactical Magic” comes to mind as does the Wayne Gretsky quote “you miss 100% of the shots you don’t take” or in the words of those old Nike ads… “just Do it”… profound and spiritual, eh? Taken together, it feels like now is the time to transition from thinking to doing. YES you can / will make that change… and it feels the it is asking for energy instead of finesse at the moment. So holler Geronimo!, pull the ripcord, light the candle, take the leap. This is probably real-world knowledge intruding, but go for it, you got the skillz! Be as open about you ideas as you feel comfortable. You and your Ideas may have more support than you think. Be as witch-y Tarot-y Nature-y Herbal-y Baker-y as you want. It’s easier to move from thoughts to actions when you are able to sense that those actions and the things that come from those actions (your ideas made manifest) will be accepted and supported. I’m guessing just such support is about to reach critical mass for you. Boom-in a good way. If you feel up to giving some feedback, I’d appreciate it. Email me at modernoracletorot@gmail.com and that will keep it more private than using the comments below.